You can give one person up to $15,000 yearly without incurring any taxes. In fact, you can give multiple people a gift of up to that amount, and they don't even have to be related to you — your son, your daughter, your best friend, your manicurist, whoever. So, if you give your favorite niece $25,000, you only owe taxes on the $10,000 above the $15,000 limit. And a gift need not be cash. It could be stock or real estate or cars. What's more, the limit is per person, not per couple. Your spouse could give that lucky soul the same amount, doubling your household's giving and you're personally still staying under the yearly $15,000 ceiling. Note that only you, the giver, are on the hook to pay any tax, and not the recipient. The tax stops people from giving all their money and property away during their lifetimes to skirt the estate tax when they die. 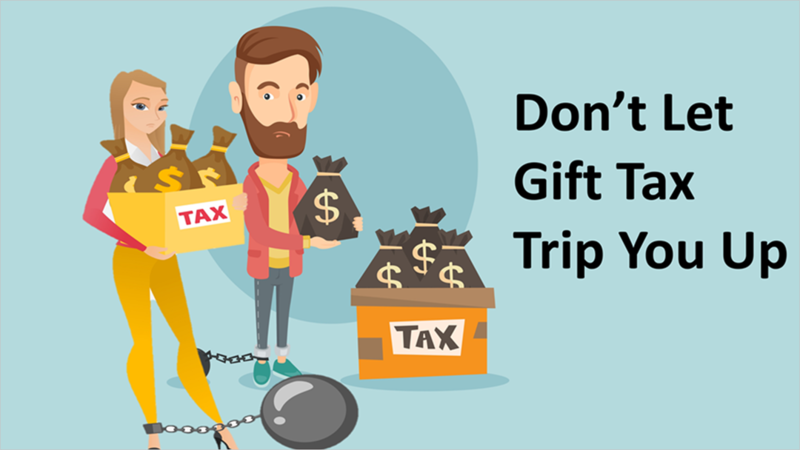 The good news is that — with a little planning — you don't have to pay the gift tax right away, and maybe never. In addition to the $15,000 per recipient annual limit, there's a lifetime exclusion amount, $11.4 million in 2019 — this covers all your lifetime giving to everybody. With the lifetime exclusion, your estate pays what you gave in excess of that cap. The lifetime exclusion allows people more freedom to give big gifts. Example: You give your sister $40,000 this year. The extra $25,000 ($40,000 gift minus $15,000 annual exclusion) is taxable. Instead of paying that tax now, you count it against the $11.4 million lifetime number. After subtracting that $25,000 from the lifetime exclusion, you have $11.375 million still to go. It's rare for most Americans to go over the $11.4 million lifetime giving limit. But if you're well-heeled and very generous — your daughter's destination wedding in Corsica costs a bundle — then you can hit it. The gift tax rate ranges from 18% to $40%. About filing with the IRS: Every year you go over the $15,000 exclusion level, you need to file a Form 709. That way, the government can track who is on the road to reaching the lifetime $11.4 million exclusion. Some things may not seem to be gifts, but are, and you're required to file the form, like that large sum you blew on your daughter's costly nuptials. Or that $100,000 you just plugged into your grandchild's 529 college saving plan, which means $85,000 of it is potentially taxable. And if you make an interest-free loan to a friend, the IRS sees it as a gift, too. Some gifts are tax-free, provided that you give them the right way. Such as gifts for medical or educational expenses. Should you pay someone else's hospital bill, don't give the money to the patient, who then settles medical tab themselves. You pay the hospital directly. Ditto for education. Instead of giving the money to the student, write the check to the school. Giving to your spouse or a charity is also totally free from the gift tax. One sure thing about gifts is that they make people happy. Staying within the rules makes the tax man happy, too. It's best to consult a qualified tax professional about this topic, and we are here to help.